Complete the perfect summer BBQ with these nutrient dense, great tasting healthy salad recipes. All you need is that summer sun! The words ‘BBQ’ and ‘healthy salad recipes’ aren’t normally seen in the same sentence, but hear me out on this one. Because as the sun starts to peek through the clouds, summer doesn’t feel too far away. And as our attention turns towards those summer months then that one time of the year us men take control of the cooking draws near. In essence, it’s the primal nature of the BBQ that appeals to us men. After all, it’s about starting a fire and incinerating some meat, what’s not to like about that? So is there really a place for healthy salad recipes with your summer BBQ? In my opinion there is. Because if your household is anything like mine when I was growing up, then Dad looked after the BBQ, while Mum made the salads and accompaniments. Usually, the meat ended up burnt to a crisp on the outside and virtually still breathing on the inside. On the other hand, Mum’s salad was always immaculate and lovingly presented (not to mention supremely tasty). And while it was over to Mum to rescue the meat, we all tucked into those refreshing salads. Often it was the salad that was the best bit. Even if it was to just cover the taste of burnt chicken and blackened sausages. So in this week’s instalment of meal prep Sunday I’ve got 2 great tasting and healthy salad recipes. 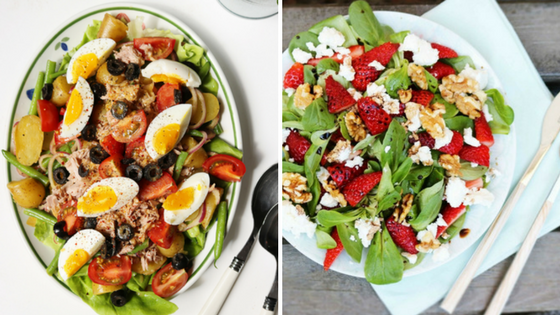 And these aren’t your regular boring healthy salad recipes. As a matter of fact, these are packed with tons of macros and micros to keep your meals well balanced while you’re indulging in all that gorgeous BBQ food. Because there’s no need to feel like you have to abandon your meal plan. In fact, the perfect BBQ can quite easily be incredibly macro friendly. And with that in mind, why not whip up one of these awesome salads when the sun next pokes its head out. Proof that the phrase ‘healthy salad recipes’ really does have a place in your BBQ-related vocabulary. Start off by halving the potatoes and cooking them in water with salt for 15 minutes. Add in the green beans in the last 5 min. In the meanwhile, make the dressing by mixing together the orange juice, mustard and olive oil. Season with salt & pepper. Cut the onion into thin rings and mix through the dressing. Next, drain the potatoes and beans, and mix with the dressing. Allow to cool a little. In the meantime, cook the eggs and wash a few lettuce leaves. Cut the tomatoes into quarters. Place the lettuce leaves on a serving platter and then place the potato and bean mix on top. Top this with the eggs, tomato’s, tuna and black olives. Firstly, remove the stems from the strawberries and cut them into quarters lengthwise. The, put the watercress in a bowl and toss with the strawberries. Next up, make the dressing by whisking together olive oil, balsamic vinegar and garlic. Season with salt and pepper. Once that’s done, drizzle the dressing over the salad and crumble the goat’s cheese on top, sprinkle with nuts. And add some of that bbq chicken to this salad to me make it just perfect. There you have it. Once you’ve worked those macros into your meal plan you can go all out on that BBQ and enjoy good food and sun safe in the knowledge you’re perfectly on plan. And what’s more, these healthy salad recipes are great to share with all your guests. So whack a huge bowl of them on the table and watch everyone compliment you on your Masterchef skills. These are meals EVERYONE will love! Is your nutrition plan set up to bring you great results? Before your finger clicks to navigate to a new webpage, spend 30 seconds asking yourself these questions. Because if you can answer ‘YES’ to any of them, then I’ve got the solution that can help you. And best of all, it’s absolutely FREE. So how would you like to discover a simple and effective way to set up your nutrition plan, right now and get the antidote to these problems? All you need to do is click the image below and register for my FREE ‘7 Steps to Get Lean’ Online Nutrition Workshop. Then, once you’re registered, make a note of the date and time in your calendar, because you won’t want to miss this. Not only will you learn all about calories and macros, but you’ll also discover the exact approach I use for both my own and my client’s programmes. And all of this great information is covered in 7 simple steps, so you can put the ideas into practice straight away. It’s the game changer you need for your fitness!